It turns out that if you’re going to do something extraordinarily stupid in a car that results in a cop being injured, one of the busiest and most surveilled places in America isn’t the best place to try it. Two suspects have been arrested in connection with Sunday evening’s Times Square burnout and hit-and-run of a New York City police officer, an incident that garnered widespread attention in the car community and in the national media. 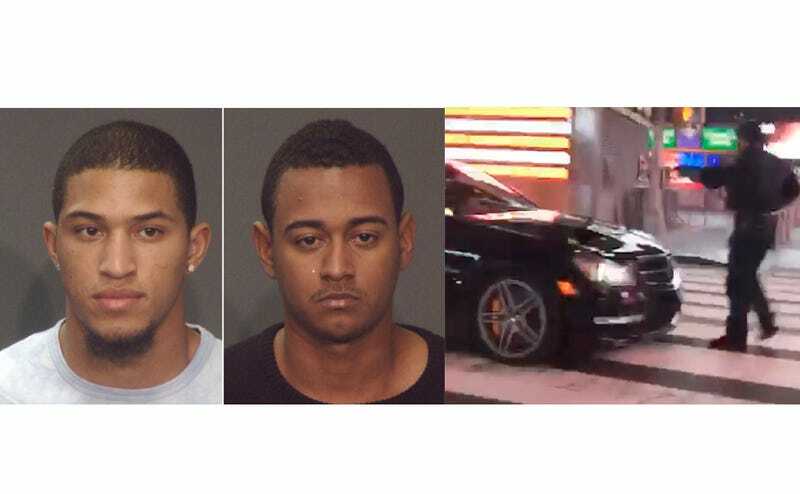 The New York Post reports that Arfhy Santos, 20, and William Lopez, 24, were arrested Wednesday evening after police identified them as the duo in the Mercedes-Benz C63 AMG that did a burnout in Times Square and then ran over a police officer. That officer, Ian Wallace, suffered minor injuries and is expected to fully recover, the Post reports. The paper reports Lopez owns the car while Santos was the one driving. A third individual in the car is being sought as a witness, police said. The car itself, however, remains at large. Charges against the two men were still pending as of Wednesday night.